Love Songs from a Shallow Grave by Colin Cotterill, a Mysterious Review. Review: Laos's only coroner, Dr. Siri Paiboun, is in the middle of investigating a series of unusual stabbings when he's invited to attend a conference in Cambodia — and is imprisoned as a spy — in Love Songs from a Shallow Grave, the seventh mystery in this series by Colin Cotterill. Three women have been killed in a similar manner, with an épée through the chest and a "Z" carved in their leg — two die when the sword penetrates the heart, the third from a nick to an artery from the carved mark on her leg — and Siri is puzzled. The murders are similar, and yet they aren't. Fencing is not a common sport in Laos, indeed, épées are quite rare, yet here he has three dead women that seem to be familiar with both the sport and its weapon. Each spent time in Eastern Europe before returning to Laos, but there is nothing to indicate they knew one another — either then or now. Just as a suspect is identified, Siri — who has been nominated as a national hero — and his good friend, ex-politburo member Civilai, leave for a conference in neighboring Cambodia. Civilai returns to Laos when scheduled, while Siri is detained … though, in fact, Civilai doesn't quite know where his friend is. Imprisoned by the Kampuchea regime as a spy for Vietnam, Siri is tortured to admit his misdeeds, knowing that regardless of what he says or does, he has no hope he'll see his family or friends again. 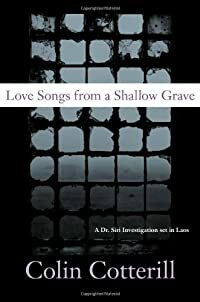 Love Songs from a Shallow Grave alternates between a diary of sorts kept by Siri while in prison ("I celebrate the dawn of my seventy-fourth birthday handcuffed to a lead pipe.") and the investigation of the épée murders. Of the former, Siri paints a dark picture of attempts to get him to confess, some physical, some psychological, though are no explicit scenes of torture. Of the latter, the case seems easy enough but Siri can't quite put his finger on why these three women were killed, though realizes who and why only after he has departed the country with no expectation of returning. As is typical of the series, Love Songs from a Shallow Grave is beautifully written with a strong sense of time and place, and infused with bits of wry humor here and there; the discussion of ministers and ministries, for example, is quite funny, and includes the new Department of Hero Creation — not yet a ministry, but vying to be one — of which Siri is a nominee. Yet overall, there's a sense of discontinuity to the plot, that there should be more of a link between Siri's time in Cambodia and the épée murder case. Indeed, the rather ambiguous conclusion may leave readers wondering whether this may be the end for Siri. Still, this outstanding series deserves a wider audience … and while this may not be the best first book to read, it should be included at some point. Acknowledgment: Soho Press provided an ARC of Love Songs from a Shallow Grave for this review.